Alliance of the Pantheon - founded by religious refugees, this fragile and religiously diverse defensive alliance now faces an invasion by the League of Armach. Avareen - a forest realm ruled by jaded and quickly multiplying sidhe noble houses. Desert of Thunder - a desert realm whose city-dwelling population is controlled by dragon overlords. Eternal Storm - devastated by still-prevalent elemental forces, this region attracts brave and foolhardy prospectors in search of fortunes. Flannish Cities - the center of modern urban civilization, this young region is currently setting the standards for prosperity and development. Gawaris Desert - a deeply religious desert nation split among different interpretations of religious doctrine. Gol Algor - a joint dwarven and gnomish realm with innovation as its highest principle. Gol Grungor - the deeply conservative heart and soul of dwarven culture. Gol Murak - a dwarven realm besieged by the surathi of the Snake Kingdoms. Great Southern Chaos - a giant swamp where ruins of ancient civilizations abound. Hamajan Mountains - a fractured mountain nation of mystics living in retreat from the world. Hobgoblin Dominions - an old nation of hobgoblins struggling to redefine itself in the modern world. Lake of Dreams - the cradle of civilization, now gradually fading to irrelevance. Lands of the Dead - a harsh northern land periodically plagued by undead and other monsters. League of Armach - an alliance of city-states bent on conquest. Malundi - a southern jungle region isolated from the rest of the world. Narevoreen - former elven island paradise now struggling to keep up with humanity. Norfjell Wastes - a cold wasteland now plundered for resources. Parginian Rim - the former heart of the Atalan Empire where each city now tries to find its own way. Siebenbund - a mountain realm populated mainly by halflings with far more influence in the world than is first apparent. Snake Kingdoms - ancestral home of the depraved surathi snake-men. Star Mountains - the highest mountains in the world - and the gateway to the solar system. Sunset Province - a formerly independent nation recently conquered by the Tsan Empire. Thenares - a theocracy dedicated to the glory of Thenos. Tuvareen - an elven realm fallen on hard times, now resorting to stealing human children. Verdant Coast - a coastal region now suddenly thrust into prominence thanks to a continent-spanning underground passage. This region roughly corresponds to Europe, Northern and Central Africa, and the Western parts of Asia on Earth. They are intended as the "main area of interest" of the setting. 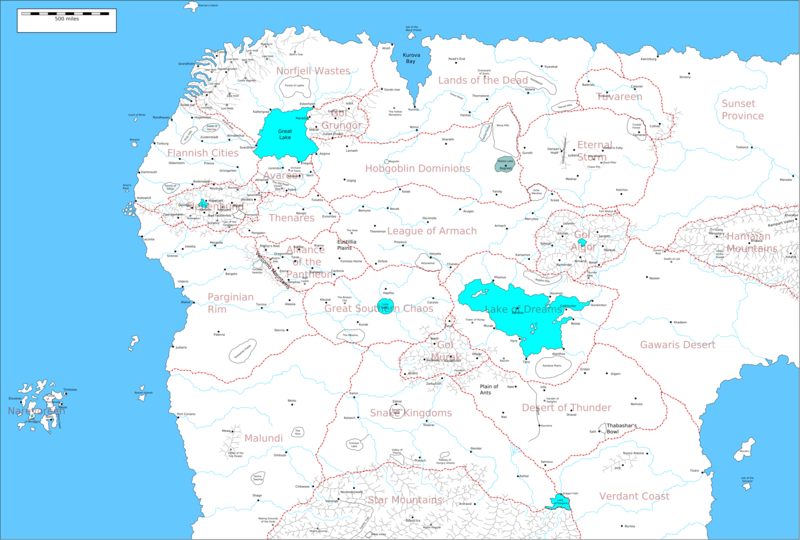 The Flannish Cities, as the most "advanced" region represent the heart of the setting, and the rest are a mixture of civilized and wild regions that the PCs can either visit or come from. You can download an SVG version of the map here. This map can be edited with Inkscape, a freely downloadable vector-based graphics program.